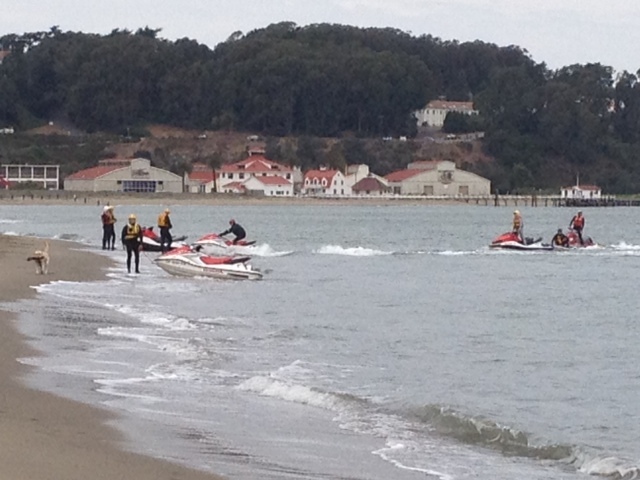 Skies were gray but the temperature mild and the San Francisco Bay was filled with activity. The America’s Cup race takes place on the Bay later in the summer and the ORACLE, current title holder, was out today practicing. What a sight it is to see the big boats sail! The Vuitton Challenge is currently taking place and the Kiwis raced the Italians today. The big boats bring out the fans and the San Francisco waterfront was a beehive today. 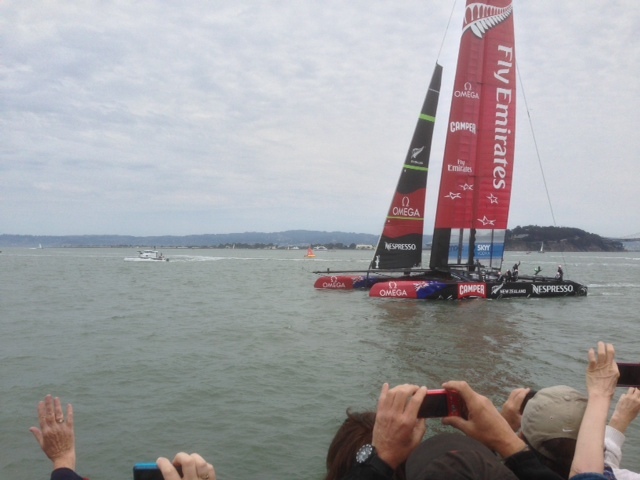 The Kiwis won the race but both big boats gave the fans at America’s Cup Park a flyby. What a sight! Perched on headlands at the top of Ocean Beach overlooking Seal Rock, The Cliff House is a San Francisco landmark and is celebrating its 150th anniversary. It first opened in 1863 and has been delighting San Franciscans and tourists ever since. Even a cloudy day does not discourage visitors. 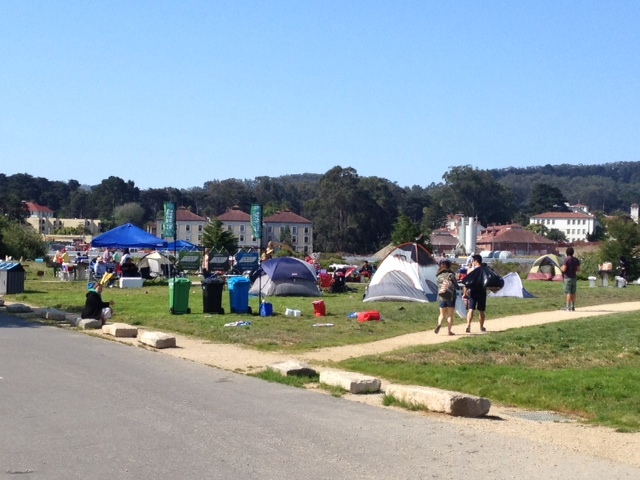 People are everywhere – enjoying the views from Lands End, exploring Sutro Baths and eeperiencing The Cliff House. Damaged and rebuilt several times over the years, The Cliff House continues to lure visitors. The history is fascinating, the food superb and the views outstanding. There are historical photos on the walls showing its history and you can really appreciate the San Francisco of old. It is one of our favorite destinations and you can look it up in PowerHiking San Francisco or at http://www.powerhiking.com. Several days of celebration are planned so it is a perfect opportunity to visit. Happy 4th of July! San Francisco is looking forward to an exciting and fun-filled holiday. 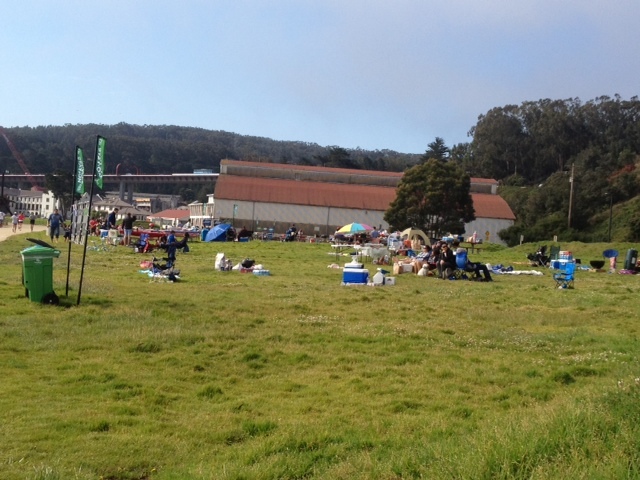 Everyone is out early on Crissy Field enjoying the sunshine, some fishing, some games, a barbeque and good old fashioned Fourth of July fun! Tables and barbeques have been set up early in anticipation of the day. It is a particularly exciting and historical Fourth in San Francisco as today is Opening Day of the Summer of Racing and the America’s Cup. For the first time the sailing races will take place in San Francisco Bay. Today is the opening of America’s Cup Park and the America’s Cup Pavilion. Race teams will be present for photos and autographs and the Pavilion will ring out with musical performances all weekend. The excitement of the Louis Vuitton Challenge is about to begin, with the winner challenging for the America’s Cup later in the summer. It will be a fabulous day by the Bay on the San Francisco Waterfront, culminating with a fireworks show off Aquatic Park. HAPPY FOURTH OF JULY from POWERHIKING! You are currently browsing the Powerhiking's Blog blog archives for July, 2013.